Twin leaf is a perennial plant; the horizontal, fleshy rootstock with matted fibrous roots produces a simple, naked scape, 12-18 inches tall. Emanating also from the rootstock, the large, smooth basal leaves, 3-6 inches long and 2-5 inches wide, are divided into 2 half-ovate leaflets. Blooming from April to May, a large, solitary, white, 8 petaled flower terminates the scape. The fruit is an obovate capsule. The plant is only 6-9 inches tall in flower, but is double that height in fruit. Grows in limestone soils and in woods near rivers from Ontario westward to Wisconsin and southward to Virginia and Tennessee. Too rare to harvest. 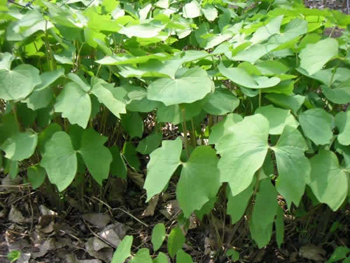 Twin leaf is used for chronic rheumatism, nervous and spasmodic problems, neuralgia, headaches, especially headaches with dizziness and feelings of tension, stress, syphilis, scarlatina, scarlet fever, diarrhea, kidney gravel, dropsy, urinary infections, and cramps. In small doses, it is used as an expectorant and a tonic; in large doses, as an emetic. As a gargle, it is useful for throat infections. Applied externally as a poultice or fomentation, it will relieve pain anywhere in the body, treats ulcers, sores, inflammations, and cancerous sores. Decoction: steep 1 tsp. root in 1 cup boiling water for 30 minutes, then simmer 10 minutes and strain. Take 1 cup, then follow with small frequent doses. Tincture: a dose is from 5 to 20 drops. Too rare to harvest. Probably toxic.